I miss seeing your posts! Good to see you cartfly! I resized your avatar as a mini avatar to use in your sig line until we get avatars restored on the forum. Thank-you, I am presently practicing on the directions. Could you post SM, photo side by side, with Kyron's "Sunshine" artwork? The eyes of the sun and SM look identical to me. 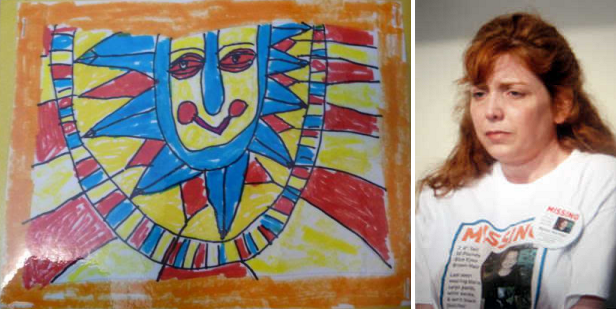 Her photo is on the page and his sunshine art drawing is also on the same page. Brandi Where do I find (IMG)-(IMG)? You can copy/paste the above code. Delete what you have there and paste this line in. It took me 45 minutes of reading over there to figure out what "SM" meant! I always think of Scared Monkeys when I see "SM." I am assuming you meant SM to be step mother of Kyron? If so, I did this properly. If not, let me know what you wanted. Brandi, I absolutely love the choices you've given my head-in-hand monkey! Thanks so much for doing this. I'm going to put Patriotic me in my profile now. You are so wonderful! Feel free to switch them around if you like! I love doing these, if you ever need or want something done again, just let me know! Seahorse, delete what you have in the sig box in your profile, and copy this line exactly, starting with the [img... Then paste it there. Sorry, goodness, see I should not have assumed. Thank-you so much, it is so clear now the artwork eyes look like Terri Moulton Horman's. I thought it was unusual for the faces to look the same. Art H in his fun hat and I miss the Seahorse but I am so happy with Popeye, he brings back so many good memories. I am interested in the history of Scared Monkeys. I do not need to know for any reason, just curious who the inventors are for this site and when it was born. Who is the longest posting monkey? Thank-you, Brandi, so much. Most of what I have learned about the history of the blog, I learned by googling or reading old posts here. And I am not sure of the validity of all the "facts" I have found. I think you should ask Klaas if you have specifics that you want to know about SM. She has been here since the early days. Perhaps ask in Musings? Thank-you. I will try musings. Your extreme patience and your tenacity is admirable. I would like to Thank-you again for copying Kyron Horman's artwork next to the image of his Step-Mum. And can you tell me again how to - remove my monkey's from your photobucket here on SM. So your space is not taken. 1. 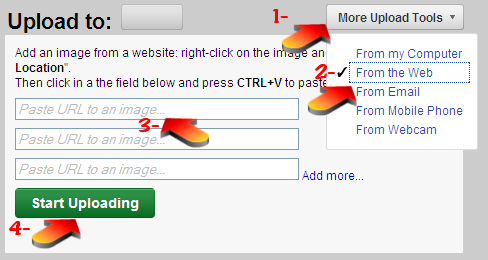 Choose "More Upload Tools"
2. Choose "From the Web"
Then your image will be in your photobucket account. If you have any questions about how to use that image on the forum, let me know. P.S. Hopefully we'll have our avatars back up soon! Best wishes to you! I am very happy for you! I remarried in my 40's and have never been happier, myself, so I do relate! I am so glad you found a wonderful soulmate. I wish you both the very best! I am trying it out ... I don't think it worked though .. will see with this post.